During the PRI show last week, Power Automedia interviewed us about the Quick 6 and our future development plans. 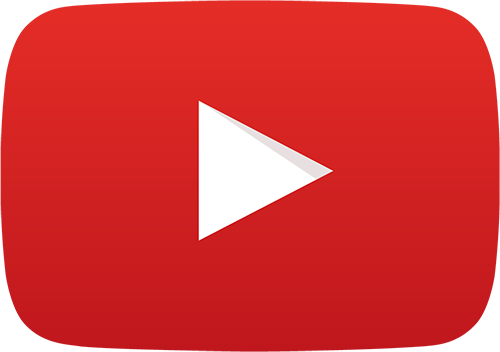 You can watch the video on the Power Automedia YouTube channel by clicking here. 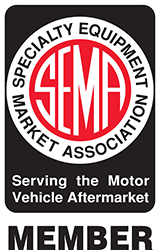 The 2018 SEMA Show begins tomorrow! If you're attending, come by and visit us at booth #20063 in the Central Hall of the Las Vegas Convention Center. We'll have our latest products on display and hope to see you there! As we work to develop support for ten speed transmissions, we swapped the 4R70W in our 2004 Mercury Grand Marquis for a 10R80 transmission and have been documenting our progress. To learn more, visit the Silver Bullet page. US Shift transmission control systems from Baumann Electronic Controls represent the state of the art in electronic transmission control. US Shift products are cost-effective, easy to install, and easy to use for high-performance and heavy-duty applications. 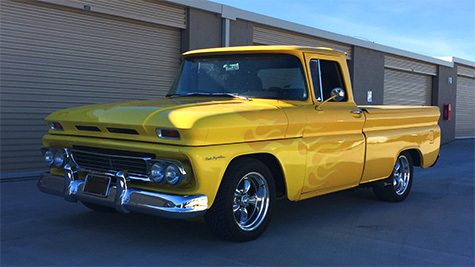 US Shift products are equally well suited to the finest street rods, 8-second drag cars, off-road vehicles, high-powered diesels, motor-homes, and specialty applications. 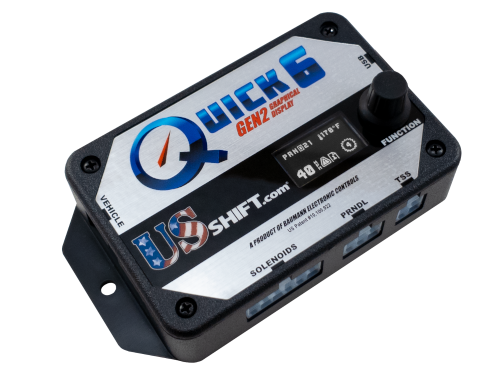 US Shift controllers feature the smallest size, most useful features, and greatest value of any transmission controller on the market. Best of all, they are proudly made in the USA. Our 18 years of transmission control experience have provided us with a working knowledge of what customers want most. Modern electronics technology and innovative design allow us to deliver the best features and performance with minimal size and cost. We believe there is no better transmission control system available at any price. Once you compare the features of US Shift to the competition, we are certain that you will agree. 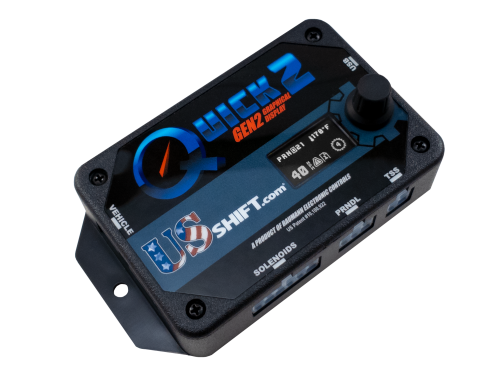 US Shift products are the only transmission controllers on the market with a native USB interface and free tuning software for fast and easy PC connectivity with no adapter cables. 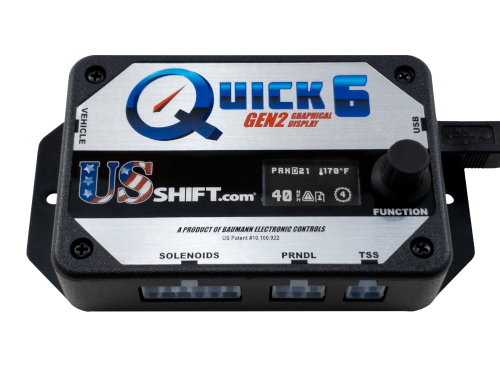 The US Shift Quick 4 and Quick 6 controllers also feature a built-in 3-character display and rotary control for monitoring system parameters. Displayed parameters include transmission fluid temperature, current gear / mode, vehicle speed, TPS voltage, and battery voltage. The built in tuning interface allows the most common settings to be changed without using a PC or laptop. For most users, the built-in tuning interface will be adequate to dial-in their transmission, while the ultra-fast USB interface and intuitive Windows-based tuning software will satisfy even the most advanced tuners for no extra cost. Our wiring harnesses are constructed from high-temperature, automotive-grade cross-linked polyethylene (GXL / TXL) wire and utilize the correct original equipment connectors for each transmission. The standard wiring harnesses are complete and require as few as three connections to produce an operating transmission. The design of US Shift controllers and wiring harnesses are optimized to simplify installation and troubleshooting. Like our intuitive tuning software, our installation manuals are straightforward, well illustrated, and easy to follow. 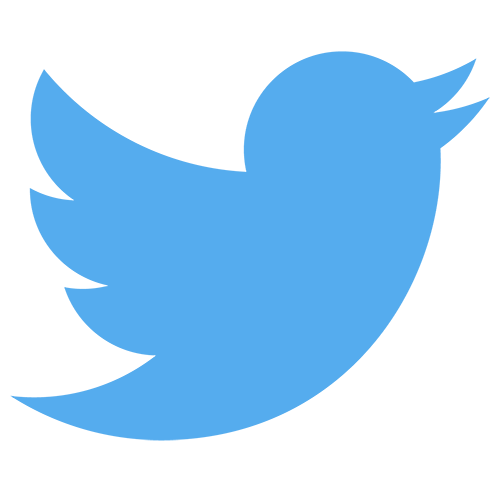 We also have ample, experienced technical staff to answer your questions and assist you with any concerns that you may have. Most importantly, you will find that Baumann Electronic Controls is 100% dedicated to product reliability and customer satisfaction. All US Shift products come with a five-year full replacement / repair warranty and the best technical support in the industry, so you can be confident in choosing our products. I contacted US Shift to see if anything was in the works and they were in the middle of Quick 6 development. I stayed in regular contact with Jake, and one day the Quick 6 became a reality. I was offered a Beta Tester slot and I jumped at the opportunity. This turned out to be a great experience. There were a couple of hiccups at first, but Karl was right there to work through it. Once we got the initial settings worked out, I began adjusting the tune. This time, I was able to take full advantage of the Quick 6 software (no constant-pressure valve-body). It was very easy to navigate and any questions I had were immediately answered. I spent a lot of time perfecting the programming to my liking. I wanted to thank you all for your amazing product. I purchased a Quick 4 for my built GM 4L80E in January of 2017. I finally finished my truck. The shifts are perfect. Could not ask for a better product. The use of a Laptop makes the shift points even better. Thanks again. I purchased a Quick 4 transmission controller to replace the [competitor's] controller in my 1970 Chevelle. I had been running the [competitor's] unit for several years and it worked OK, but was a royal pain to program and did not offer multiple tables like the Quick 4 does. 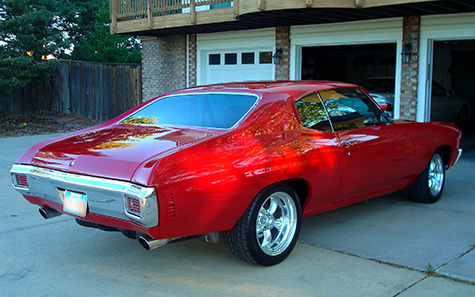 My wife was not fond of riding in my Chevelle because it shifted so hard, which was what I wanted. 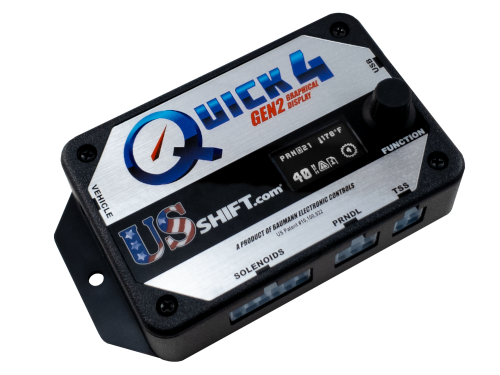 The Quick 4 allows me to have a shifting profile for the wife, one for me, and an additional two to use for whatever. With the flip of a switch or the turn of a knob, I can switch between the tables and please my wife or myself. Read more on our Customer Stories page. Have your own story to share? 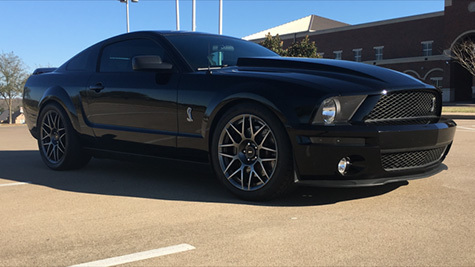 Send an email to support@usshift.com with pictures of your vehicle attached and we might feature it here! Why Should You Choose US Shift? Learn about what makes the US Shift product line stand out from the crowd. 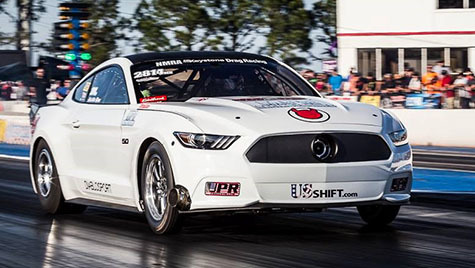 Designed utilizing sophisticated algorithms specifically for performance applications, US Shift's REVolution Architecture offers groundbreaking features and capabilities that are new to the industry while also providing enhanced shift quality and driveability. With REVolution, your transmission becomes an integral, critical part of your combination, allowing you to maximize its performance using either the Quick 6, Quick 4, or Quick 2 controller. Our top-of-the-line controller for 6R80 transmissions. Our top-of-the-line controller for 4R70W, AOD-E, E4OD, 4R100, 4L60E, 4L70E, and 4L80E transmissions. A no-frills system for 4R70W, AOD-E, E4OD, 4R100, 4L60E, 4L70E, and 4L80E transmissions. Find useful information that covers a wide range of topics about the US Shift Transmission Control System.